Infineon released new package XHP3 flexible IGBT module for scalable design with reliability and highest power density. The scalability has improved because of its design for paralleling. The IGBT Module offers symmetrical design with low stray inductance, it offers significantly improved switching behavior. This is the reason that the XHP3 platform offers a solution for demanding applications such as traction and commercial, construction and agricultural vehicles as well as medium-voltage drives. The XHP3 IGBT module features a compact form factor with 140 mm in length, 100 mm in width and 40 mm in height. 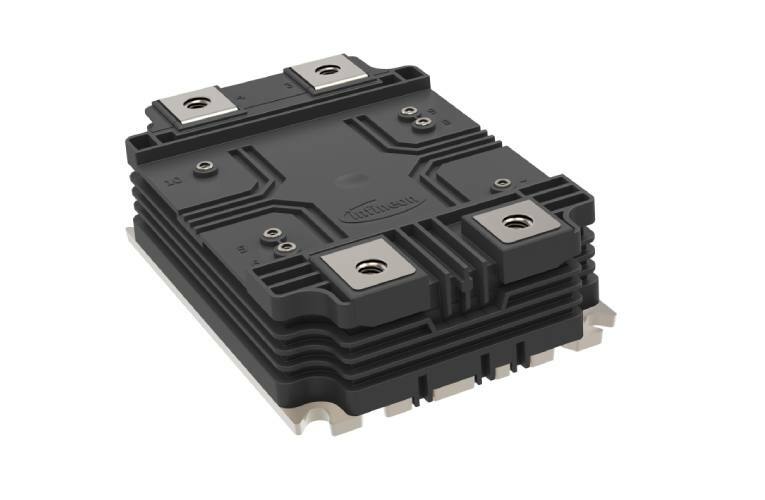 It also features new high-power platform feature a half bridge topology with a blocking voltage of 3.3 kV and a nominal current of 450 A. Infineon has also released two different isolation classes: 6 kV (FF450R33T3E3) and 10.4 kV (FF450R33T3E3_B5) isolation, respectively. Highest possible level of reliability and robustness is achieved with Ultrasonic welded terminals and aluminum nitride substrates along with an aluminum silicon carbide base plate. System designers can now easily adapt the desired power level by paralleling the required number of XHP 3 modules. To facilitate scaling, pre-grouped devices also offered featuring a matched set of static and dynamic parameters. Using these grouped modules, de-rating is no longer required when paralleling up to eight XHP 3 devices. The samples of XHP3 3.3 kV IGBT modules are available and can be ordered now at Infineon website.